The report's co-writer Dr David Murakami-Wood told BBC News that, compared to other industrialised Western states, the UK was "the most surveilled country". "We have more CCTV cameras and we have looser laws on privacy and data protection," he said. "We really do have a society which is premised both on state secrecy and the state not giving up its supposed right to keep information under control while, at the same time, wanting to know as much as it can about us." The two worst countries in the 36-nation survey are Malaysia and China, and Britain is one of the bottom five with "endemic surveillance". If it prevents criminal behaviour or improves its detection I'm all for it. "We've got to say where do we want the lines to be drawn? 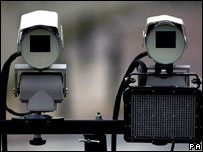 How much do we want to have surveillance changing the nature of society in a democratic nation?" he told the BBC. "We're not luddites, we're not technophobes, but we are saying not least don't forget the fundamental importance of data protection, which I'm responsible for. "Sometimes it gets dismissed as something which is rather bureaucratic, it stops you sorting out your granny's electricity bills. People grumble about data protection, but boy is it important in this new age. "When data protection puts those fundamental safeguards in place, we must make sure that some of these lines are not crossed." The Department for Constitutional Affairs (DCA) said there needed to be a balance between sharing information responsibly and respecting the citizen's rights. A spokesman said: "Massive social and technological advances have occurred in the last few decades and will continue in the years to come. "We must rise to the challenges and seize the opportunities it provides for individual citizens and society as a whole." Graham Gerrard from the Association of Chief Police Officers (Acpo) said there were safeguards against the abuse of surveillance by officers. "The police use of surveillance is probably the most regulated of any group in society," he told the BBC. "Richard Thomas was particularly concerned about unseen, uncontrolled or excessive surveillance. Well, any of the police surveillance that is unseen is in fact controlled and has to be proportionate otherwise it would never get authorised."